DBT of South Jersey-The Dialectics of Mom Guilt! There is a lot that I could tell you about DBT, but for now I'll try to keep it to what is relevant (See What is DBT here: https://behavioraltech.org/resources/faqs/what-is-dbt/ for more info). 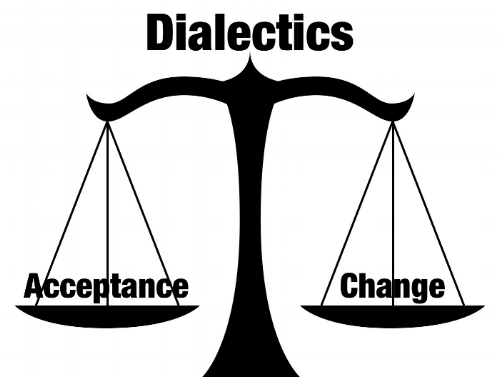 Briefly, dialectics is finding the balance or truth between two seemingly opposing sides. One of the key dialectics in DBT is finding the balance between acceptance and change. It seems like acceptance and change are total opposites, but actually there is truth in both! For instance, acceptance doesn't mean you are against change; instead, accepting where you are right now allows you to work on changing things by starting with how they actually are. While I'm very new to this parenting thing, I've noticed that it doesn't take long for Mom guilt to set in (read - almost instantly). Take a deep and natural desire to do the best for this new tiny human who depends on you for life, add tons of conflicting information on how to care for said tiny human, and throw in some sleep deprivation and a boatload of hormones to make us extra vulnerable to extreme emotion and you have a solid recipe for Mom guilt! Let me illustrate how DBT, and dialectics in particular, has helped me cope with the onslaught of Mom guilt. Parenting offers you an endless sea of choices and, in the moment, those choices tend to feel like they will all be life-altering. That somehow the decision about which bottle and breast pump combo to use will some how have drastic lifelong consequences (yes, I really did spend about roughly 52,738 hours making that decision). Catastrophizing much? Our emotions are so important and have several vital roles. One of the roles of emotions is to motivate us to action. My love for my child motivates me to try to do the best things for him, which leads me to researching all of these seemingly life-altering choices only to find a lot of very conflicting information. The myriad of options leads me to feel fearful of making the "wrong" choice and accidentally messing up my kid for life, which would obviously violate my values leading to... Mom guilt! Does this sound a touch dramatic to you? Well, welcome to what unjustified fear does to the brain! On one hand, sleeping on their back on a firm, flat surface is safest and on the other hand, he was not able to sleep in his crib or bassinet but would sleep in a rock and play (eg. a titlted surface). On one hand, babies need to learn to sleep independently and on the other hand, he will only nap while being held. On one hand, put your baby down drowsy but awake so they learn to go to sleep by themselves, and on the other hand, nursing to sleep is natural. On one hand, there are cry-it-out sleep training techniques, and on the other hand, there are no-cry/gentle sleep training techniques. I could go on, but all of my current dilemmas seem to be sleep-related. Sleep is a hard thing in our household these days! My son is an absolute joy, but let's just say that sleeping is not his superpower. When I find myself getting lost in the sea of choices, I come back to doing what works for us right now. If it stops working, we will do something else. There was so much freedom to letting go of my quest for the "perfect answer" or what we "should" be doing right now. I've worked to accept my son's difficulties sleeping for now, instead of working against them. Surprisingly enough, this has not only come with more freedom, more joy and less anxiety, but he doesn't cry as much at nap time, he can sometimes go to sleep without nursing, and we are actually trying to transition him to his crib again and it's going better this time (so far....fingers crossed)! Such an example of the dialectic between acceptance and change. Accepting where we were right now instead of fighting it gave me so much more peace and allowed me to see our best options with more clarity. It was only then that things began to change! If I catch myself catastrophizing, I find the checking the facts skill to be so useful to peel back my assumptions, judgments and worst case scenario ideas from the actual reality. The facts are that while it feels (and is) important, any of these decisions aren't going to make or break my role as a parent. Also, even if I *do* make a choice that I later regret, I honestly was doing the best I could with the information I had at the time. Chances are I will get a chance to make a different choice the next time, which allows me such freedom and much less worry! Using skills takes practice while letting our emotions run the show comes much more naturally. You simply won't remember to use them every time. My husband can testify that just this week, even after reminding myself of these skills by writing this, I found myself worrying that my child (who doesn't sleep well or nap by himself yet) was sleeping "too long" after I put him down in the crib alone. HA! Luckily, he reminded me to be mindful by being in the moment with him, going with the flow, and doing what works (aka spend some time with him!). Thank goodness for people who lovingly remind you to be skillful....over and over again! Dr. Chiu is a licensed psychologist with advanced training and specialization in Dialectical Behavior Therapy (DBT). 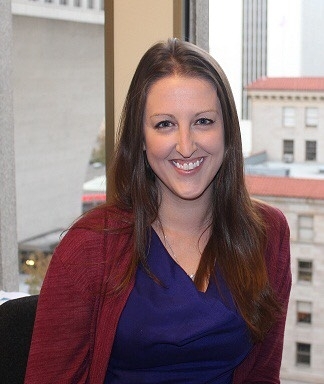 Her expertise is in working with adolescents, adults, couples, and families with a variety of presentations and difficulties, including self-harm and suicidal behaviors, emotion dysregulation, mood, anxiety, and substance use disorders, with a particular interest in the integration of religious beliefs, particularly Christianity, into the counseling process. In her spare time, she is an extrovert who loves spending time with people in any way possible. Her favorite thing to do is to spend time with her husband and their new, energetic son!